Every Christmas, I like to include at least one handmade (by us) gift for the boys. 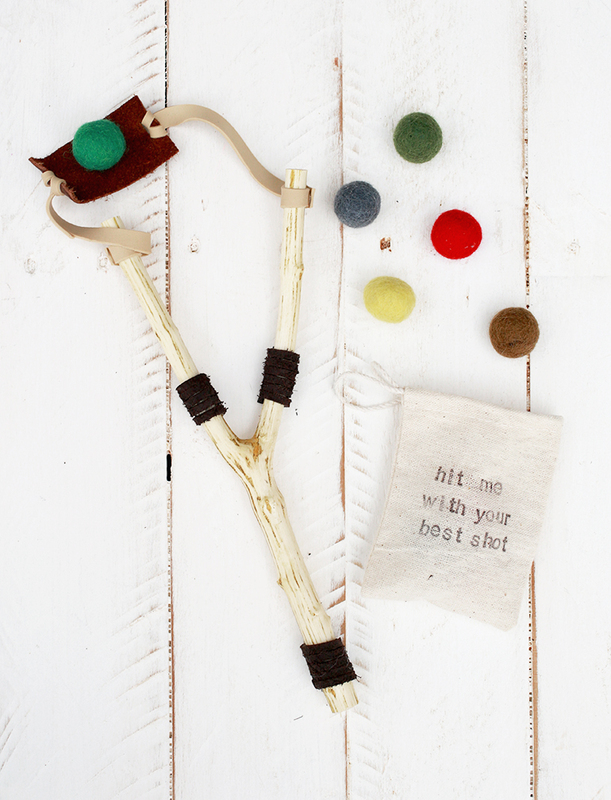 This year’s gift are these fun slingshots! And yes, Levi is in these photos, playing with his gift before Christmas…thankfully he’s pretty used to Caitlin & I handing him things and saying let’s take pictures, and then being done with the item when the photo shoot is over. That, and him being only 4, make it a safe bet that out of sight – out of mind will work in our favor! I did try to hide them from the older boys, although one of them did catch a peek of me editing photos and said I want one of those shooter things! So, at least I know they’ll be well liked! I think this would also make a fun stocking stuffer for the guy or gal in your life that’s still young at heart. 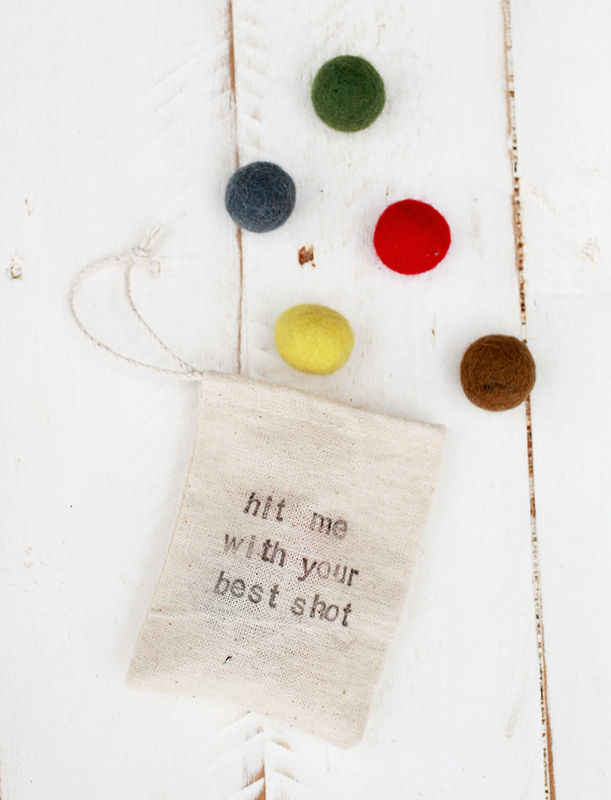 It was pretty fun shooting the felt balls during my “testing”. There’s just something so appealing about simple, classical childhood toys. And ones that you can make yourself, without spending too much time or money on, are even better! 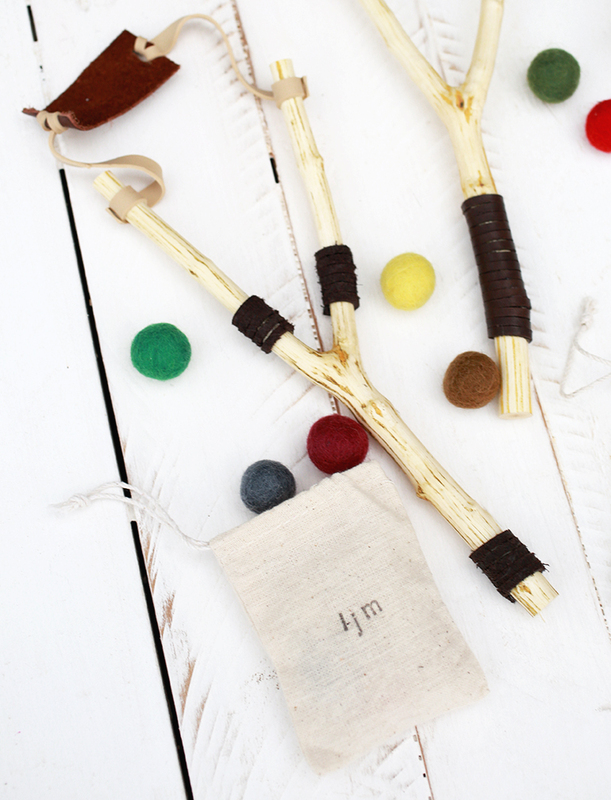 I had all of the supplies on hand from previous crafts, and we collected the sticks from our yard. 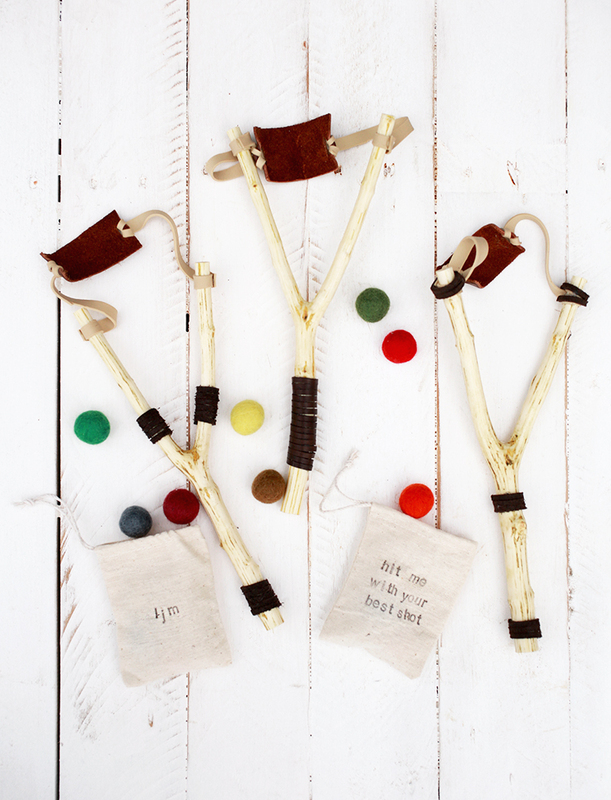 I did buy an extra bag of pom poms for the boys though – I didn’t want to lose all my felt balls! Cut sticks to size if needed (you can also remove the bark if you’d like). Sand down the ends and any rough spots. 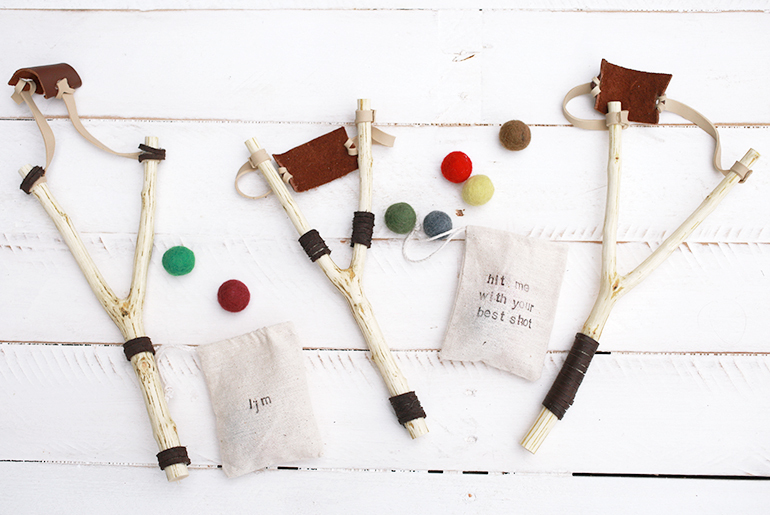 Coat sticks with polyurethane if desired (ours do not have it, only because I forgot!). Cut a piece of leather into a small rectangle. Cut a small slit into both sides of the leather. 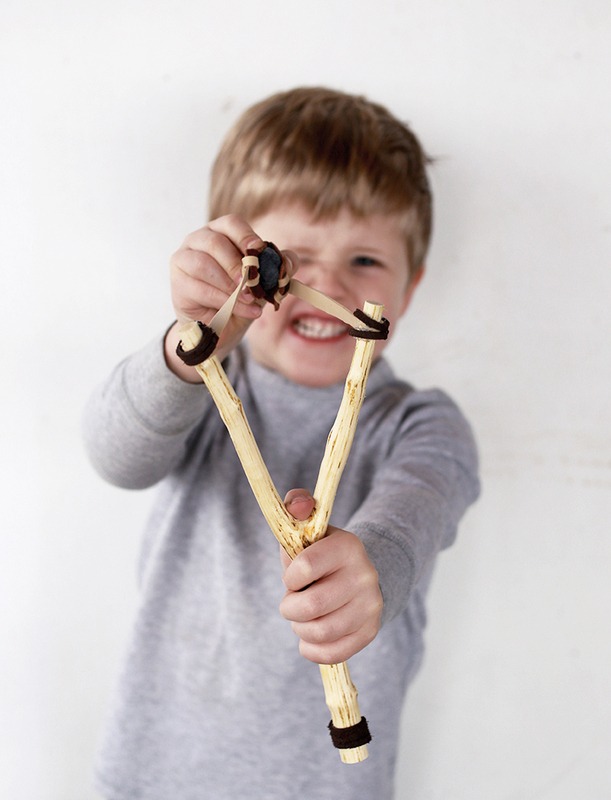 Cut rubber bands to size – you will need two for each slingshot, make sure that they are the same exact size for each stick (ours are 6.5″ long). Cut a small slit at both ends of each rubber band. Slide one end of the rubber band through the slit, forming a small loop. Slide the other end of the rubber band through the slit in the leather, then pull the looped end through the slit, creating a loop around the leather. Repeat with the other rubber band. Slide the looped ends over the ends of the stick, pull to tighten. Use the hot glue to glue down the ends of the rubber bands, on the stick and leather (not necessary, but helps it to look a little better). If desired, wrap a little leather lace around the stick, using the hot glue to glue it down. Or you can add paint. 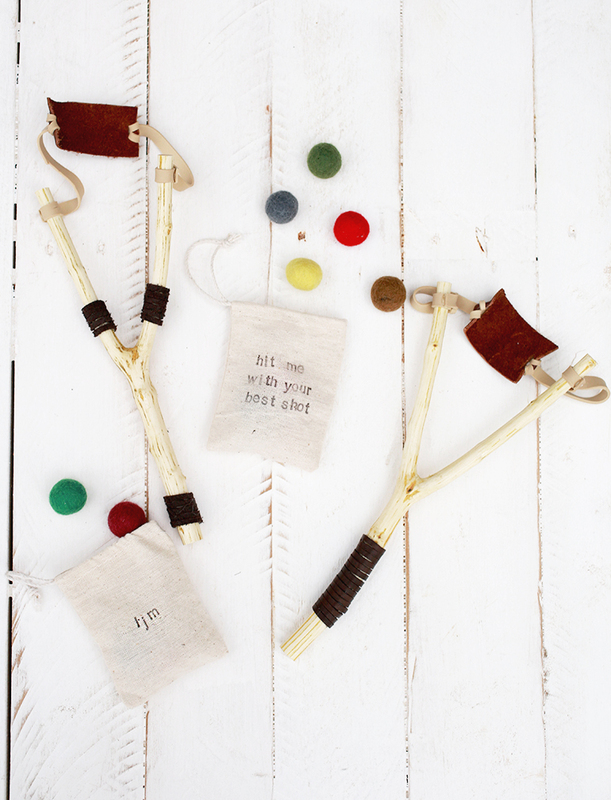 Stamp (or paint) muslin bags if desired and fill with felt balls or pom poms. 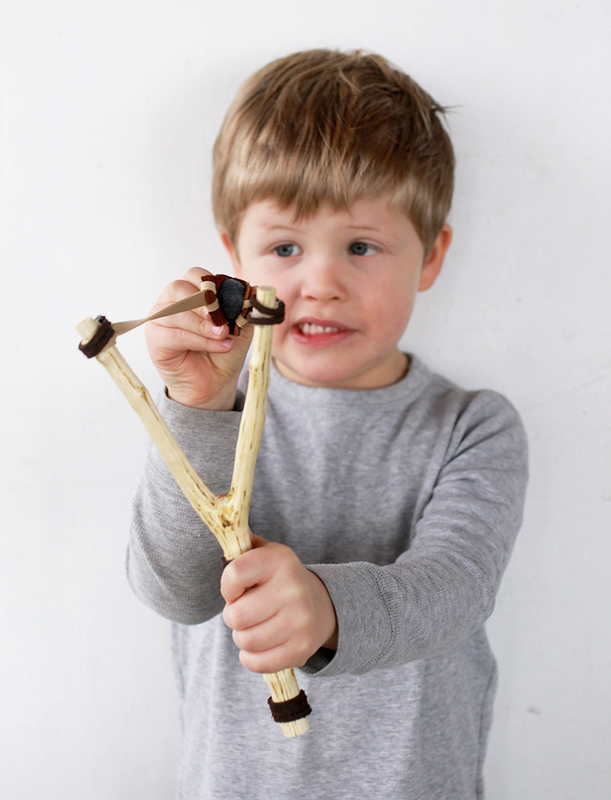 And this little guy was pretty fierce with his slingshot…or maybe not. 🙂 I had to restrain myself from posting a million pictures of all the hilarious faces he was making during this shoot! What are some of your favorite classic childhood toys?